Some eight years ago, Marine Kyle Carpenter, from Gilbert, SC, threw himself onto a live grenade in Afghanistan to save a fellow Marine’s life. His heart stopped three times as doctors worked to save him, but miraculously he survived. But the blast took Carpenter’s right eye and injured his left eye. Both of his eardrums were damaged and most of his teeth and lower jaw were shattered. He was in a coma for five weeks, then underwent dozens of surgeries – a grueling recovery that’s been recounted in magazines and documentaries. Four years later, at age 24, a year after enrolling at the University of South Carolina in August 2013, Carpenter was awarded the nation’s highest military honor, the Medal of Honor, by President Barack Obama. And when he graduated from USC with a bachelor’s degree in international studies, he was given a rousing standing ovation. Today, on Memorial Day 2018, we honor Carpenter and every single member of our armed forces, both those now serving and those who have retired. We thank them for their heroic service on behalf of the nation we love. On this Memorial Day, as on every last Monday in May, we honor the men and women who so bravely risked life and limb in the face of grave danger. We remember those who left friends and families at home to fight for us and for freedom, especially those who never returned home to trade the title of soldier, sailor, airman, Coast Guardsman or Marine for veteran. Today, as we honor these heroes we put any thought of politics aside and we reflect upon the bounties of our nation, our state, our community and remember that it is the sacrifices of those who serve that makes all of this possible. These men and women are indisputably heroes. When their country called, they answered. Their bravery and commitment to our nation must always have our respect and gratitude. 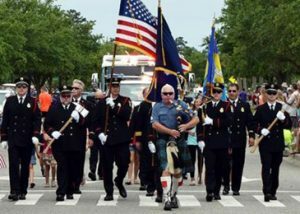 Here in Horry County, many observances are underway – from the Veterans March on Ocean Boulevard in Myrtle Beach, to the Memorial Day Remembrance Ceremony at the Myrtle Beach Convention Center. From Bikefest to Surfside Beach’s Memorial Day Golf Cart Parade, all of these events honor and remember those who have served. We at HCDP salute our veterans. We stand for you, and we always will.